A refreshing alternative to milk. With rice. Without thickeners. Gluten and dairy-free. 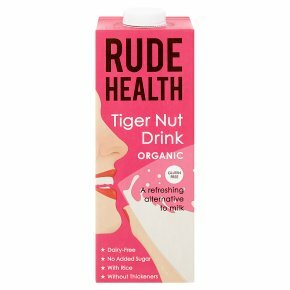 Contains natural sugars from rice & tiger nuts. No added sugar. Vegetarian Society approved. Suitable for vegans. Kosher.The drink that roared Spoiler alert: tiger nuts aren't nuts, and have nothing to do with tigers. But they are stripy in a tiger-print kind of way, and they grow underground, which makes them the most glamorous tuber in our book. Creamy with a hint of sweetness, horchata made from tiger nuts is a speciality of the city of Valencia where they drink it over ice, and in Mexico where they serve it hot with cinnamon or vanilla.